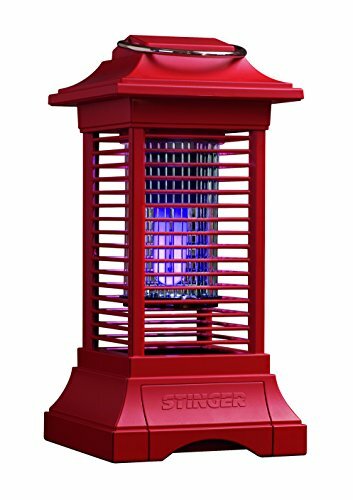 The Stinger BKC90R Cordless Insect Zapper represents one of the most interesting options for larger spaces. This zapper can cover areas of up to 625 square feet which makes it one of the best options on the market in terms of range and top-level performance. It’s worth noting that such large areas can only be covered with two or three combined zappers from the competition at this price point. This puts it into a league of its own for people looking to maximize mobility while also using it for energy-independence. The system also comes with an included rechargeable battery and is available in 3 colours; red, blue or black. 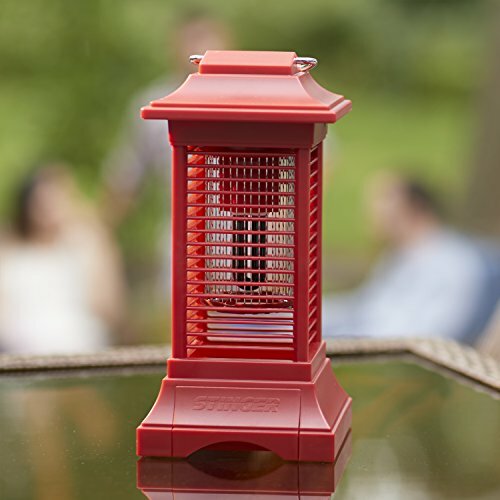 Unfortunately it still doesn’t solve the Bug Zapper vs Mosquito Trap question, but don’t let that put you off what is a seriously effective piece of kit! This device will prove to be one of the most interesting choices for users looking to maximize the performance in terms of space coverage. 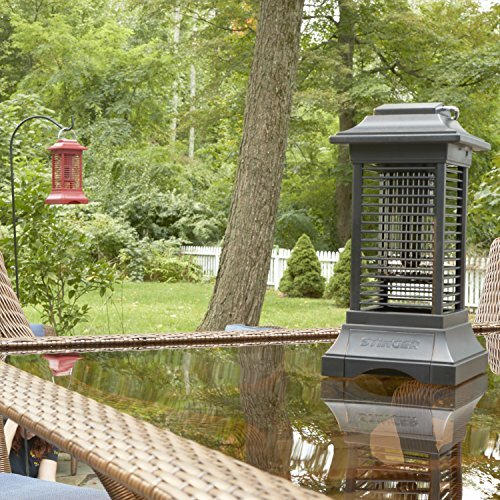 With a performance which can work in a 360 angle with areas of up to 625 feet, the bug zapper will prove to be one of the most efficient designs on the market. It will offer everything you need for such a large scale device which is a top performance and easy maintenance. This means that the zapper can also be used for commercial spaces such as office buildings since it comes with the added performance and the increased power. As always, you should compare it with other devices to ensure you are making the right choice for your situation. In terms of employed technologies, the zapper is using the UV light technology. The ultra-violet light will act to lure insects, bugs and mosquitoes and it will eliminate them on the spot. This means that the zapper can be one of the recommended options if you plan to have a comfortable home but it can also attract and kill the insects even before they reach into your home. The large capacity of the zapper recommends it for rooms of any size. If you plan to use it outside, you should know that it is lighter than most users expect. With a weight of just over 3 pounds, it represents a problem with very strong winds if you place it on the ground outside. This is why you will need to ensure proper anchoring when it might face strong winds. One of its best characteristics is given by the cordless design. This means that you can easily move it around without the need of a constant electricity source. The zapper takes about 3 hours to fully charge and can work for up to 3.5 hours on a single charge. This means that the device can be a real solution when you travel away from home either on weekends away or even at picnics. Although it might lack refinement, this unit will definitely make up with the cordless design which allows it to have an energy-independence which is not that common in the market. When it comes to comparing the device, it might not be as easy as you would expect since there are very few options which can cover such considerable areas in this price range. 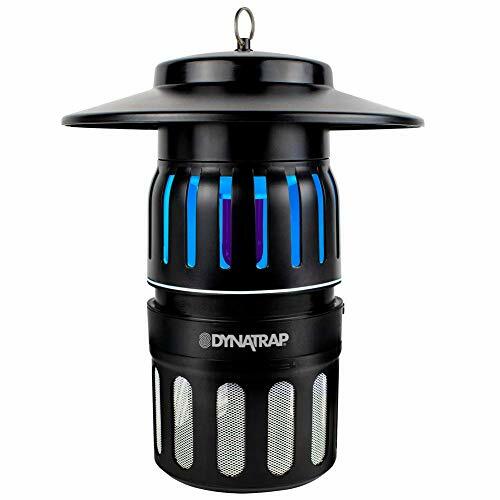 Other comparable, stand-alone devices that can cover similar or larger areas are usually found in the higher-end devices, so we strongly recommend checking out our Ultimate Mosquito Traps buyers guide, including the Flowtron BK-15D which offers a similar operating range, but does require an electricity outlet in order to function. The fact that the Stinger zapper can cover areas of up to 625 square feet recommends it as one of the recommended options for those who want to maximize the performance beyond what can be achieved with traditional alternatives. But comparing it in terms of performance can be possible. 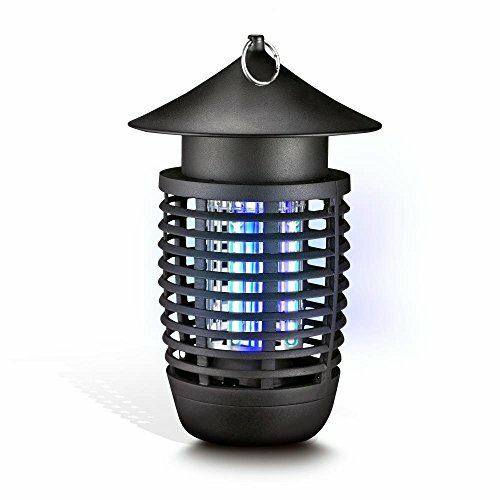 This is why you will be able to compare it to the SereneLife Electric Bug Zapper. Both zappers will work with a 360 angle approach and they will cover good areas. Of course, the Stinger zapper will cover a considerably larger area. This is why both manufacturers include the possibility of hanging both zappers as a higher visibility point will attract more insects. The main difference in design will come with the fact that the Stinger zapper will also be able to be placed on the ground. Since you may not be able to hang it on a campsite for example, this will prove to be a good design characteristic. Even more, both zappers will use the same UV technology to kill most insects. The difference will be made in the way you clean the device every day. While the SereneLife zapper might have an extra step to perform to remove the cleaning bucket, the Stinger will be more straightforward. So which zapper should you choose? Since they both come with a similar UV technology, you should concentrate on the covered area. Thus, if you want to cover an area of up to 200 square feet, the SereneLife zapper can prove to be one of the top options. 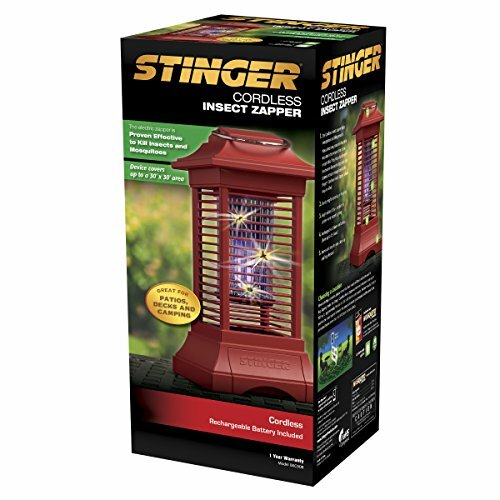 If you need to cover a significant area both indoors and outdoors with a powerful zapper that can reach up to 600+ square feet, the Stinger zapper will represent one of the simplest options which you can find on the market today. When it comes to a top level performance, there are not many devices that can actually match the Stinger BKC90R Cordless Insect Zapper. This means that it will represent a solid option for users who want the added versatility of being able to eliminate insects in the comfort of their home but who also need a solid option for outdoor use as well. Thus, going camping will not have to equate to mosquito bites anymore. Interestingly, the zapper comes with rechargeable batteries and a cordless design which will add to its performance. The gained energy-independence recommends the zapper as one of the top options when it comes to working closely with a device which can eliminate insects and mosquitoes for up to 3.5 hours on a single charge.